Woocommerce All Discounts offers a large variety of tools combined cleverly in order to let you create the ultimate discounts in your Woocommerce shop. To create a discount, click on the menu Discounts > New Discount to access the discount creation page. Start date : Date from which the discount is applied. End date : Date when the discount ends. Users limit : Authorized number of customers that can use the discount (leave empty to disable that feature). Rules group relationship : Relation between the rules groups. If the value for this field is set to AND, then all conditions in all groups should meet in order to apply to discount. However, if the value is set to OR, then all conditions in at least one group should meet in order to apply the discount. Rules : Rules that MUST be checked in order to apply the discounts. Please note that this field is not mandatory. The rule is made up of a set of conditions, with an operator and then the value. 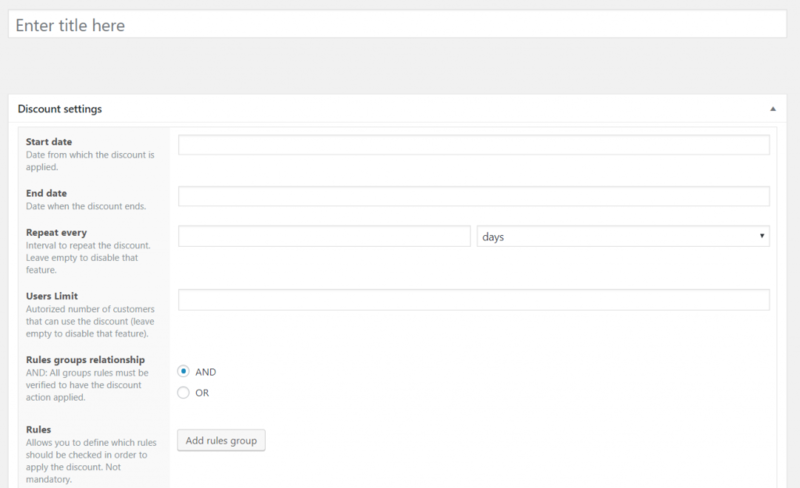 You can add as many rules groups as you need. In each group, as you select a different condition, the operator and the value fields change. If Customer role : applies a discount if the customer has one of the specified roles. If Customer email domain name: applies if the customer email domain name fits any of the values you add e.g. yahoo.com, gmail.com. You can add more than one value, separated by commas. If Customer : applies a discount to a specific customer. If Previous orders count : applies a discount based on the customer number of previous orders (processing or completed orders only). If Total spent in shop : applies a discount based on the total amount spent in the shop. If Previously ordered products count : applies a discount based on the quantity of previously ordered products. If Previously ordered products : applies a discount based on the belonging of products ordered to a specific products list. Order subtotal : applies a discount based on the order subtotal. Order subtotal (including tax): applies a discount based on the order subtotal including the taxes. Order items count: applies a discount based on the number of items in the cart (is a multiple of, is more or equal to, is more than, equals, is less or equal to, is less than). If Different Order items count: applies a discount based on the number of different ordered items in the cart. Order products : applies a discount if the customer orders at least one item in the list selected in the value field (Manage the product list section to know more about the products lists). If Customer reviewed any product : applies a discount based on all the products of a list if the customer has reviewed at least one of the products that list. If Customer reviewed a product: applies a discount based on a product of a list if the customer has reviewed that product. If Payment gateway : applies a discount based on the payment gateway the customer is using on checkout. If Customer billing country: applies a discount based on the customer billing country. If Billing state : applies a discount based on the order billing state. If Shipping country: applies a discount based on the order shipping country. If Shipping state : applies a discount based on the order shipping state. If Shipping Method: applies a discount based on the shipping method selected. If customer has subscribed to MailChimp List : applies a discount if the customer has subscribed to the selected MailChimp list. If the customer has subscribed to SendinBlue List : applies a discount if the customer has subscribed to selected SendinBlue list. Customer subscribed to NewsletterPlugin List : applies a discount if the customer has subscribed to a newsletter managed by the newsletter plugin https://wordpress.org/plugins/newsletter. If the customer is following an affiliation link : applies a discount if the customer is following an affiliation link. This works with the AffiliateWP plugin. Customer belongs to specified groups : apply a discount if the customer belongs to a group managed by https://wordpress.org/plugins/groups/. If shop currency : applies a discount based on the currency used by the customer. This is much useful in a shop that handles a currency switcher. Percentage off product price: defines the discount percentage off the products in the selected list (Check the product list section to know more about the products lists). Fixed amount off product price: defines the discount amount off the products in the selected list (Check the product list section to know more about the products lists). Fixed product price: Defines a new fixed product price that should be paid by the customer. Percentage off order subtotal : defines the discount percentage off the order subtotal. Percentage off order subtotal (including taxes) : defines the discount percentage off the order subtotal with the taxes included. Fixed amount off order subtotal : defines the discount amount off the order subtotal. Fixed amount off order subtotal (including tax) : defines the discount amount off the order subtotal with the taxes included. Percentage off shipping fees: defines the discount percentage off the shipping fees. Fixed amount off shipping fees: defines the discount amount off the shipping fees. Fixed shipping fees: defines a new fixed shipping fee that should be paid by the customer. Free Gift : defines a list of items the customers can choose from on the cart page as free gift. Percentage / Fixed amount: discount’s percentage / fixed amount. Products list: List of products the discount would be applied on (Check the product list section to know more about the products lists). Gifts list: The list of gifts available for the customer to choose from on the cart page (This list must have been previously created in the Product list section). Gifts limit: The maximum number of products each customer can select within the gifts list. Disable on products and shop pages: this lets you decide to enable or disable the display of the discounted prices, on all pages except the cart and checkout pages. Once you have made your selections, you can Publish or Update the discount. Congratulations!